Now it’s time to hear the Word of God! Parent Preparation: Genesis 12:1-7, Galatians 3:6-8, Hebrews 11:8. For further reference read the following “Riches of God’s Grace in the New Covenant” by Walter Cummins pages 1-2, and pages 69-81. Abram was a man in the Bible that obeyed God. Later God gave him the name Abraham. Abram heard what God said (cup hands) and obeyed it. (Read Genesis 12:1) God told Abram travel to a place that he had never been. Yes! He did what God said to do. (Pretend to be Abram with your child. Pack up clothes and food. Put them on donkeys and camels. Lead animals to a new land). (Read Genesis 12:4 and have child repeat after you.) Abram heard what God said, and obeyed. Good things always happen when we obey God’s Word. (show your child a globe, or a map of the world) How many families are in the whole world? A lot! All the families in the world can be blessed because Abram obeyed God. Abram is the great, great, great, great…grandfather of Jesus Christ! All the families in the wold can believe in Jesus Christ and be saved. People can become born again. That is a blessing! Coloring Page: Color a picture of Abram and Sarai traveling. 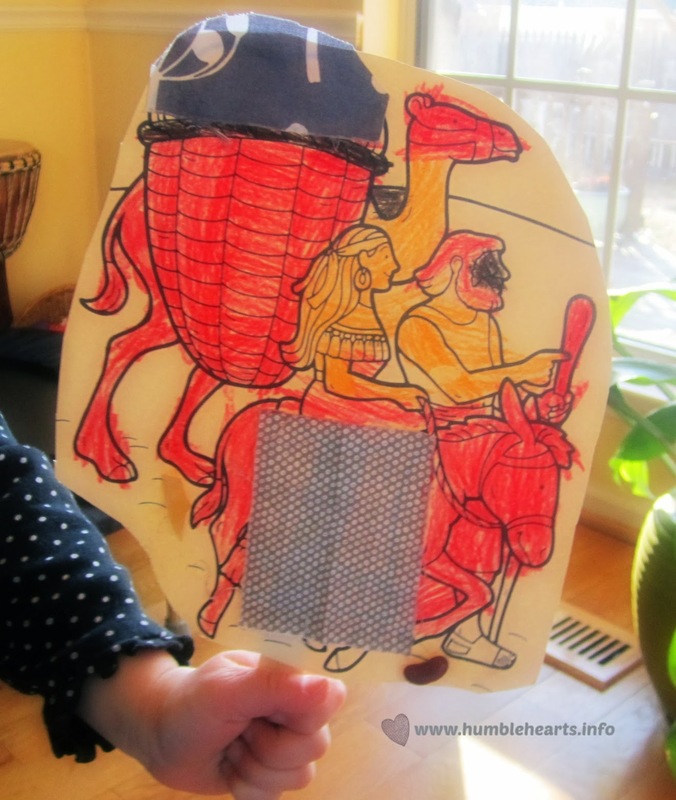 I used a page from The Really Big Book of Bible Story Coloring Pages. For extra decoration glue fabric and dried beans. 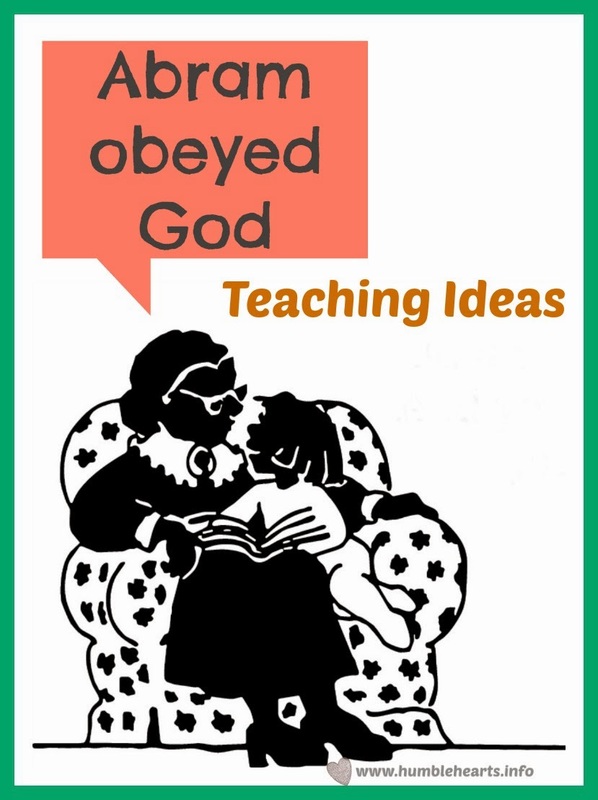 Keep the picture to make a book about people who obeyed God. 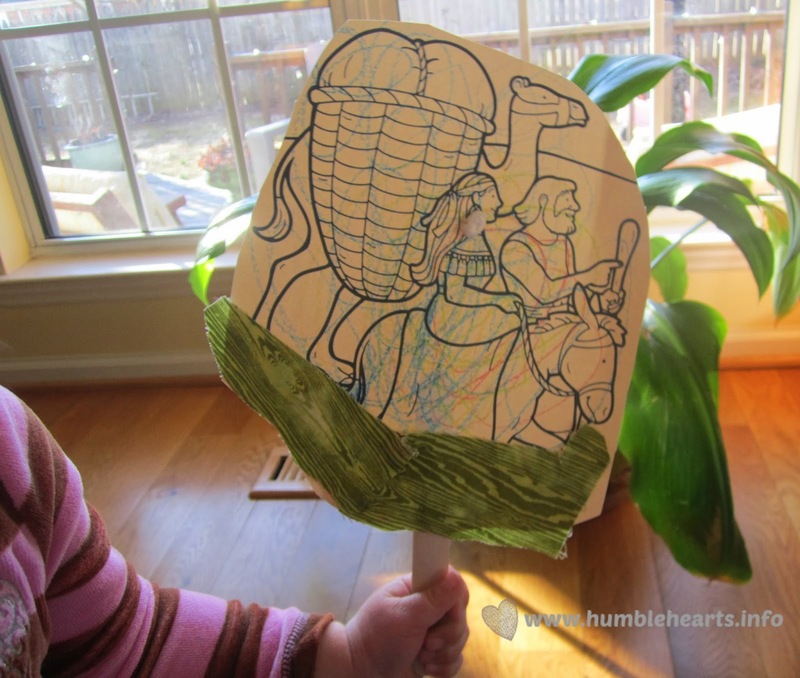 Another option is to put craft sticks on the back of the picture to make a puppet. Read More: Read more about Abram/Abraham in a children’s Bible.